Find hotel near Confederation Centre Of T .. 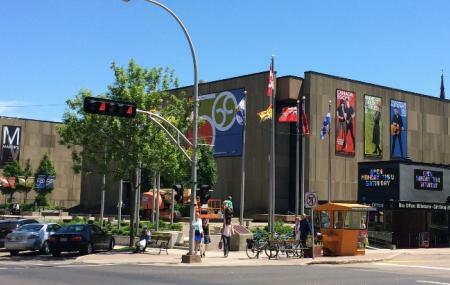 The epicenter of arts in Charlottetown, the Confederation Centre is where all the action is. At any given day, you can find a host of shows happening at this breathtaking venue; be it theatre, concerts, workshops or musicals. There is even an indoor art gallery that showcases various celebrated artworks from Canadian artistes. These depict the vast and rich history of the region and its influence on the world. The exhibitions keep rotating giving the visitor more variety to look at. The Confederation was officially opened to the public on October 6th, 1964. Since then, it has been the harbinger of art and culture in the city. The annual Charlotteton Festival is a much awaited event that hosts great shows like Ann of Green Gables and Canada Rocks. How popular is Confederation Centre Of The Arts? People normally club together Province House National Historic Site Of Canada and St. Dunstan's Basilica while planning their visit to Confederation Centre Of The Arts. Great library. Worth visiting in summer, when there’s a free show at twelve. A beautiful facility! We went for the theatre but wandering around the building was also interesting and beautiful. Neat infographic at the main entrance about the building of the centre. We went to see Anne of Green Gables the Musical which is apparently the longest running musical in the country. Good show - a bit campy but most the audience loved that. Tickets are not cheap but we went for the experience of seeing it on the Island. A top class musical facility but definitely NOT in regards to the ABBA Revisited tribute band. I've been to numerous shows here and I just can't believe how terrible the sound crew performed tonight. It is not possible that it was the normal sound crew here. The production company for the ABBA fill ins must have been doing the sound for it was a truly rookie performance compared to the normal quality provided by the centers technicians. This tribute band definitely is NOT of the caliber this facility normally provides especially at the rate the production company or box office was charging for the tickets. Truly disappointing. Someone really needs to vet these productions before allowing them to perform especially for those rates. I'll never pay to see another tribute band here ever again. A rush visit at the same day as I borrow books from the library, I notice the price is very reasonable, will definitely come back for the performance. Beside the play, this place have a lot of interesting things to see. Worth to visit with or without booking a ticket! Wow. My husband and I just happened to be in PEI when Jesus Christ Superstar was playing. What an unbelievable performance. I've been to many musicals, including many on Broadway, and this was of similar caliber. Amazing actors, fantastic voices. Better than the movie, in our opinion. Great job guys!